Oh, Komen. It's just always something with you. After a disastrous year of pulling funding from Planned Parenthood, changing their minds, firing the critically acclaimed author of "Planned Bullyhood," and giving their CEO a fat salary raise, Susan G. Komen for the Cure has taken another major hit. The non-profit cancer organization is canceling fundraising walks in seven cities because the events haven't been meeting fundraising goals. The difficult decision to exit these markets was not made lightly, as we know this bold and empowering event has touched the lives of thousands of participants like you. 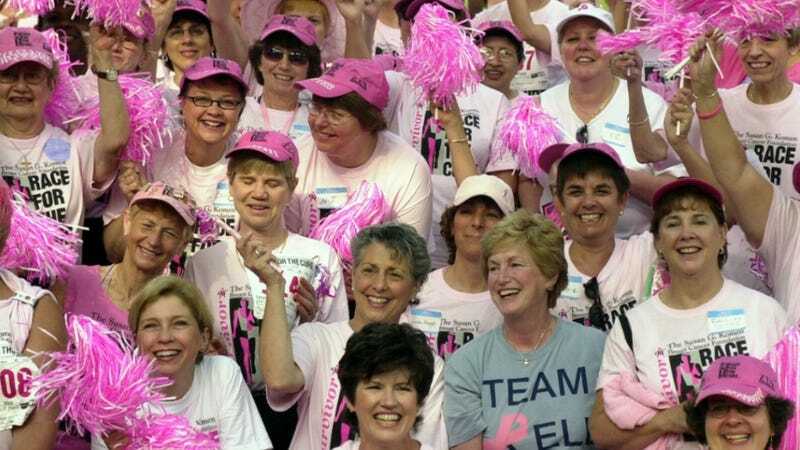 The announcement comes on the heels of several resignations from Komen's senior ranks. British Robinson, who oversaw the group's global operations, Lynn Erdman, who oversaw community health, and Carol Corcoran, senior vice president for Komen's affiliates, have all jumped ship in the last few months. But Komen being the behemoth of cancer research and fundraising that it is, it's doubtful that the organization is at its final stages. Still, the seemingly endless list of Komen disasters over the last few years have been like watching the Titanic slowly sink.